Okay guys, I’m sure you can tell I don’t wear dresses all that often. Mostly because it’s not the most convenient or comfortable running around with Aria and sitting on the floor with Amelia. 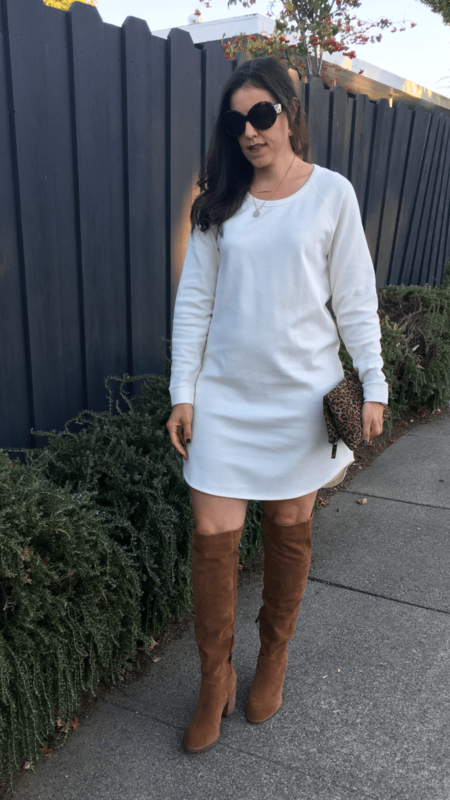 But, this James Perse dress is on a whole other level. It is THE SOFTEST thing I have ever put on. Typically I would never spend the kind of money on this dress that it ACTUALLY cost. In fact, I would say I rarely pay the original price for anything. I think that’s my secret to having designer goods. I ALWAYS wait for something to go on sale, if I like something I kind of stock it at all stores and then buy it when it finally goes on sale. The other thing I love to do is shop at Nordstrom Rack, HauteLook and we have THE BEST outlet mall near us. So back to this dress, it was originally over $250 and I got it at rack for $30…Yes you read that correctly. What a deal, RIGHT?? 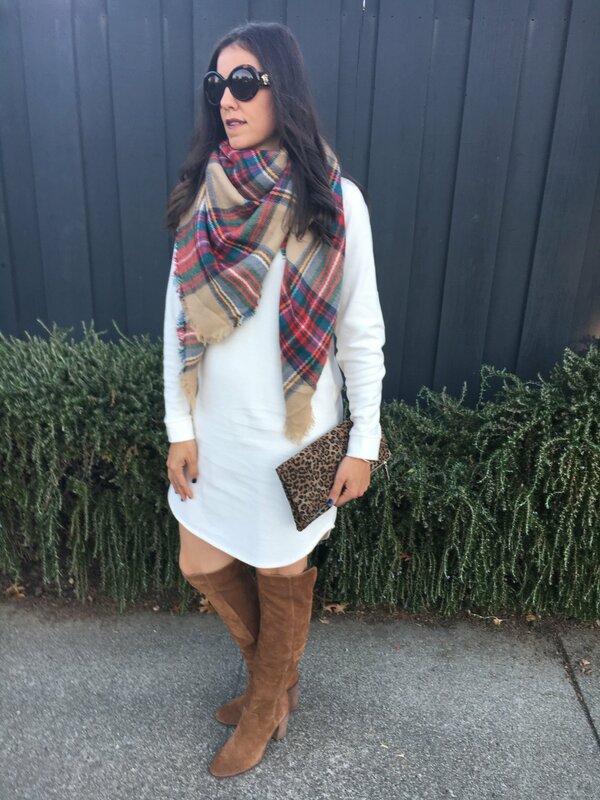 As for some of the other items in this post: Scarf $7 at Target, OTK Boots were on Nordstrom’s Anniversary sale last year, my pumps and converse are also from Rack, I bought my leopard clutch from Purple Peridot when it was their Daily Deal and my sunnies are from the Bloomingdale’s outlet. This looks is perfect for your afternoon lunch dates, happy hour, meeting up with friends and/or any casual event. One of my favorite ways to wear this dress. It’s perfectly styled for the on-the-go mom. Pairing it with sneakers is perfect for running errands, going the park with the kids or just wanting to be casually cute! This is perfect for a date night, dressier event and happy hour. Really it’s the perfect transition from that day to night look by changing up the shoes and a couple pieces of jewelry. Thanks for stopping by! Hope you all have a fantastic weekend!